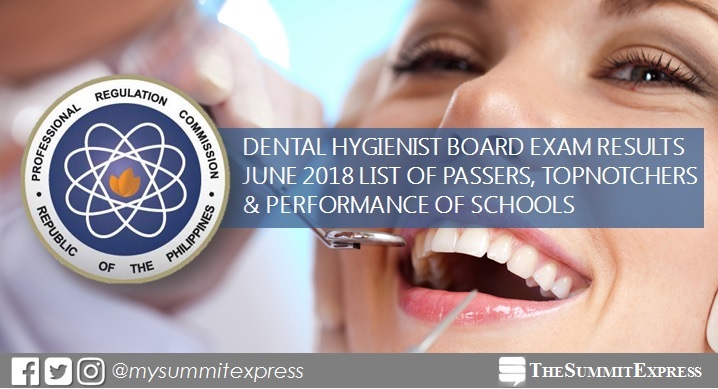 MANILA, Philippines – The June 2018 Dental Hygienist board exam results (Written and Practical Phase) including the complete list of passers, topnotchers (top 10), top performing schools and performance of schools are released by the Professional Regulation Commission (PRC) and the Board of Dentistry on Wednesday, June 20, 2018 or three (3) working days after the exam. As announced, 26 out of 38 passed the exams. PRC administered the Dental Hygienist board exam in Manila on June 14 (Written board exam) and on June 15 (practical exam). From June 25 to July 3, 2018, registration for the issuance of Professional Identification Card (ID) and Certificate of Registration will be done on-line. Please go to www.prc.gov.ph and follow instructions for initial registration. Dental Hygienist board written exam covered the following subjects: basic medical and dental sciences, clinical dental subjects I and clinical dental subjects II. Based from PRC resolution No. 2017-1068, the target release date of June 2018 Dental Hygienist board exam is on Tuesday, June 19, 2018 or in two (2) working days after the last day of exam. In the same period last year, results were released in two working days. A total of 36 out of 47 passed the Dental Hygienist Licensure Examination. Marcelita Loquias dela Pena from De Ocampo Memorial College topped the board with 84.66%.